Irish vocal trio The Priests have topped the sales of Andrea Bocelli, Charlotte Church and The Three Tenors to become one of the biggest-selling artists in the UK of the past 25 years. 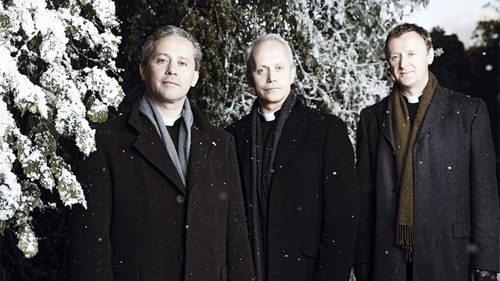 The self-titled debut album from the singing clerics is at number 10 on a new list compiled by Classic FM and topped by James Horner’s Oscar-winning score to the blockbuster film Titanic. The Priests are also the fourteenth highest-selling classical act on the new list, which was compiled to mark Classic FM's 25th anniversary. The Priests are three Roman Catholic clerics from Northern Ireland. Fr. Eugene and his brother Fr. Martin O'Hagan and Fr. David Delargy enjoyed massive success with their 2008 debut, which went to No 1 in Ireland and was also a Top 5 on the UK album charts. Horner’s Titanic soundtrack sold more than one million copies in the UK and has come number one on the Ultimate Classic FM Chart, the countdown of classical music album sales. The album was one of 26 film soundtracks on the list. Russell Watson's albums The Voice and Encore came in at second and third place respectively. Mezzo-Soprano Katherine Jenkins was the number one classical music artist of the past 25 years, selling more than 2.7 million albums on the Classic FM chart. Jenkins is joined on the list by Charlotte Church, the Fron Male Voice Choir, Bryn Terfel, Aled Jones and Sir Karl Jenkins. Howard Shore, who wrote the score to the Lord of the Rings trilogy, is the best-selling living composer - while John Williams, who composed the music for Star Wars, Jurassic Park and Harry Potter is third. The Italian pianist and composer Ludovico Einaudi came second on the list. Their hearts will go on . . .